Apparently I was completely mistaken. 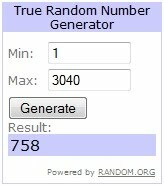 Not only are you reading the winner posts, but you like coming over to check to see who won that week's giveaways (made even more fun when it's you, of course). More than 50 of you weighed in through comments and emails about your thoughts on having a separate post versus updating the original giveaway with the winner's name and the overwhelming consensus? Don't change a thing. I'm so appreciative that you all shared your opinions, it really does make a difference. I always want to hear them, so if you have thoughts on other aspects that you like or think should be changed, let me know! I've said it before and I'll say it again: this blog wouldn't be possible without you, so thank you! Thank you so much to everyone who entered these and all of the giveaways during the Anniversary Bash, I'm so glad it was such a success and I couldn't think of a better way to have celebrated this milestone. Here's to another great year and an even bigger and better party next July! And yes, I like the separate post! Congrats to the winners! I like your blog and I think it's really nice when the blogger (such as your self) sends those special little notes out to your readers too. We're out here - I like to read blogs here and there but don't always take the time (which I probably should) to comment on things. It's just fun reading various subjects and I've learned a lot through some of the bloggers but I am a die hard giveaway lover - I'll admit it. I enter giveaways mostly because it helps compensate for loose of income while I've been caregiving for the last 4 1/2 years. Winning things really helps me out. On the flip side, I feel connected to some of the bloggers through your interesting subjects. I definitely would be overwhelmed if I took time out to write on every blog - but I realize that it would probably be the appropriate thing to do. I give you bloggers a ton of credit for taking the time out to connect to your readers and for the professionalism that goes along with being connect to the PR's and readers. Plus, you really spark interest in your personal endeavors. I agree posting about the winners is great, I always love to see who won. If I follow them by chance online. Separate posts are great. Also thank you so much I am so excited, my daughters are going to love the workbench. Congrats to the winners! I was just swinging by to invite you to join us for our Spotlight Saturday Blog Hop. Link up your blog and another you'd like to spotlight this week. I hope you have a great weekend! congrats winners! and especially ruth hill! that is at least the 4th contest you won this week! Yay congrats to the winners! Hope you have a wonderful weekend! Congrats to all the winners!!!! WAY TO GO!!!!!!!!!!!!!!!! Oh..I meant to say that I am glad you post the winners like this. Easy to find...and we can give our congrats to those who win.